The First Professional Baseball Team Was The? Long before internationally known teams and players with million dollar salaries, baseball was a more humble affair. In fact, prior to 1869 there wasn’t even a professional team to be seen anywhere in the United States. 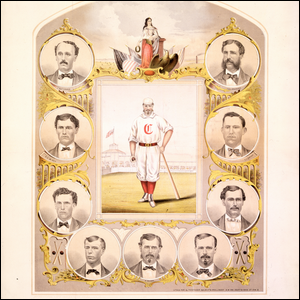 That changed the year the Cincinnati Red Stockings, precursor to the modern Cincinnati Reds, paid all ten of their players (with the highest salary being $1,400) and created the first fully salaried baseball team in American history. Adjusted for inflation, that highest salary is a modest $24,500 in current U.S. dollars. For comparison, the minimum salary in the MLB as of the 2014 season is $500,000 and the average salary in 2013 was $3,386,212. Perhaps the guys back in 1869 should have argued for bonuses based on participating in the founding and promotion of one of America’s rather profitable pastimes. Image courtesy of the Library of Congress.